Schiava: the Welterweight Knock-Out Wine! Abbazia di Novacella Schiava “Stiftskellerei Neustift” 2015. Alto Adige, Italy. 12.5% ABV, MSRP $ 16/bottle. Color is a robust, translucent ruby. The nose has sweet cherry, rose petals, and hint of limestone. On the palate, moderate bright raspberry, fresh cranberry, and a hint of red cassis are followed with lush, green foliage on the front palate. Polite, gentle acidity and tannins are balanced in body and scope. The flavors deepen across the top and back palate, with notes of slate and calcium-rich clay on the medium finish under the fruit profile. Best when served slightly chilled, and just under ‘moderate’ in body, this is a welterweight red that is luscious and mouthwatering, a wine that is beefier than rosé but lighter than the Cru Beaujolais and Burgundian pinot noir, and what a perfect wine for the middle! Pairing is so easy with vegetable appetizers, salad, fish, and pizza. After a few sips, I kept thinking of all the meals I could serve this wine for; how easily to pair this with an appetizer, soup or salad course as a brilliant impact of delicacy and deliciousness. Taking the next step in meal evolution, if you are planning a cheese plate, cured meats, or a fresh seafood course, this Schiava is still worth your consideration as a capable flavor profile with plenty of acid and personality to pair with these more challenging dishes. Even more, it would be an ideal match for white meats such as turkey and cranberry sauce or roast chicken. 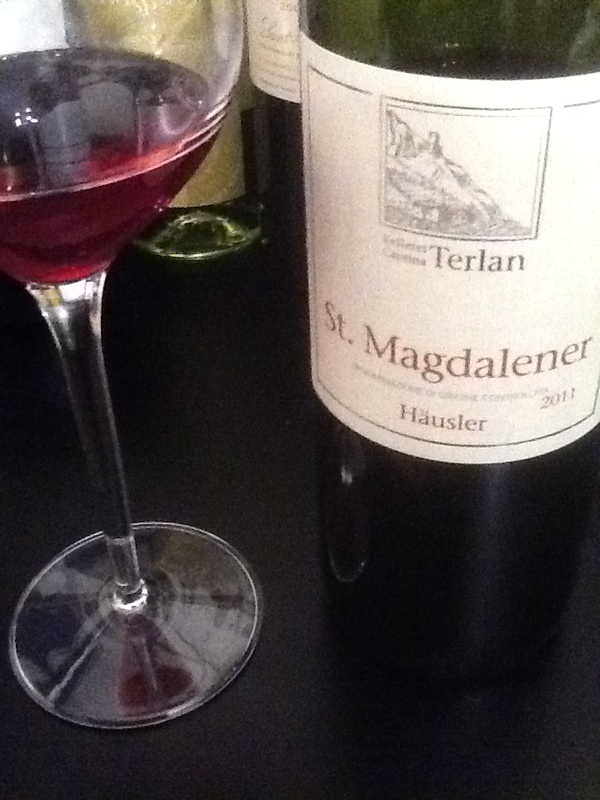 At this price, it offers an excellent value that is well worth seeking out to add to your repertoire and cellar, and is a beautiful representation of both the uniqueness and subtlety one can find in the wines of the Alto Adige. This one will go ten full rounds and win by decision as a crowd-pleasing favorite. I recently had an opportunity to get up close and personal with some amazing Alto Adige DOC wines, and I was impressed with the quality, the flavors, and the prices of these wines. They will have a regular place in my vocabulary and cellar from here on out, and it’s time we looked closely at them. Trust me, you will be glad you did! Cantino Valle Isarco Schiava DOC 2011, Sample Provided by Alto Adige Wines. ABV 12%. No MSRP listed. This schiava is bright ruby in the glass with a nose of young cherries. On the palate, very delicate- the softest of the reds I tasted, light with gentle tannins. With balanced acidity and tannins, this wine pairs best with pastas, appetizers or a meat & cheese plate. This is a tasty and light summer red. Though not easily found, it is available in NYC through the distributor: www.panebiancowines.com. 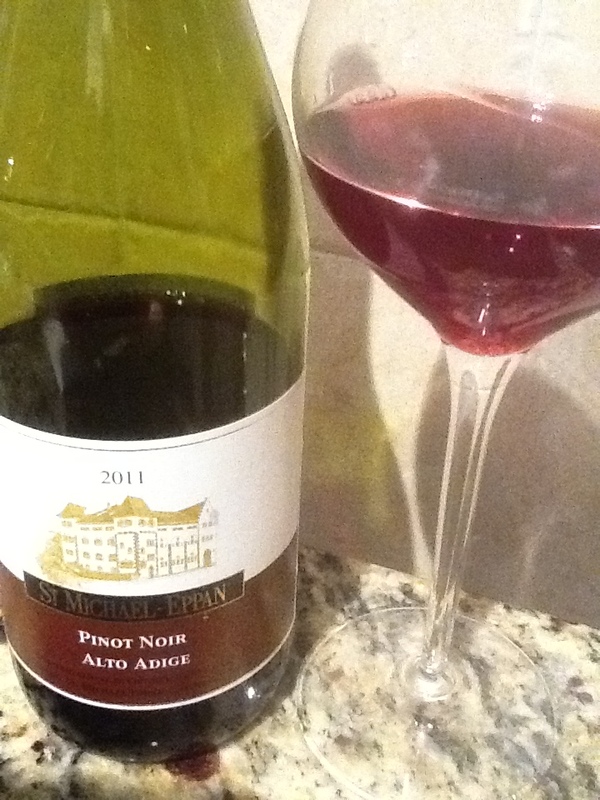 St. Michel-Appan 2011 DOC Pinot Noir. Sample Provided by Alto Adige Wines. 13% ABV MSRP $13. Color: Pale ruby with clear edging. Nose: hints of red fruit, raspberry and cherry blossoms together with a note of old wood. On the palate; a fresh young blend of blackberry, cherry, and cassis is delicate going down. Harmony is demonstrated by matching young fruit and the right amount of acidity together with supple tannins for a very enjoyable experience. It paired beautifully, after opening, with basic rigatoni pasta a garlic and olive oil, and side of steamed broccoli. Ideal to cut the garlic from the palate, leaving my mouth refreshed. This would also be a great appetizer wine, with the lush fruit and crisp acidity this is a sommelier’s pairing dream. A very strong competitor against both US pinot noir and Burgundy, I was surprised at how good this wine is for the price, and I kept finishing my tastes early- the bottle was gone far too soon. In NYC, you can find this wine at Gotham Wines & Liquor . Color is pale ruby center with garnet notes, translucent with clear edging. A delicate nose of ripe red fruit, ancient wood and a hint of limestone. In the mouth, it expressed more body and depth than I expected, fresh fruit and nice crisp acidity with gentle tannin. Instead of layers of flavor, I experienced singularity of flavor and location. This wine screams Tyrol, and reminds me of hiking in the mountains and taking an early dinner with thinly sliced meats, a house salad, a side of pasta, and fish. This pairs delightfully with each of those, and is just as nice by itself. When you buy this wine, whether its for yourself or a friend, don’t stop at one bottle. It goes down so easily, you’ll open it while you’re cooking and finish the bottle before dinner is ready. It took all the patience I had to save enough to try this with fajitas, stir-fry, burgers, and pasta and this wine went the distance with each one. In the NYC area, this is available from NJ-based www.trainoswine.com . 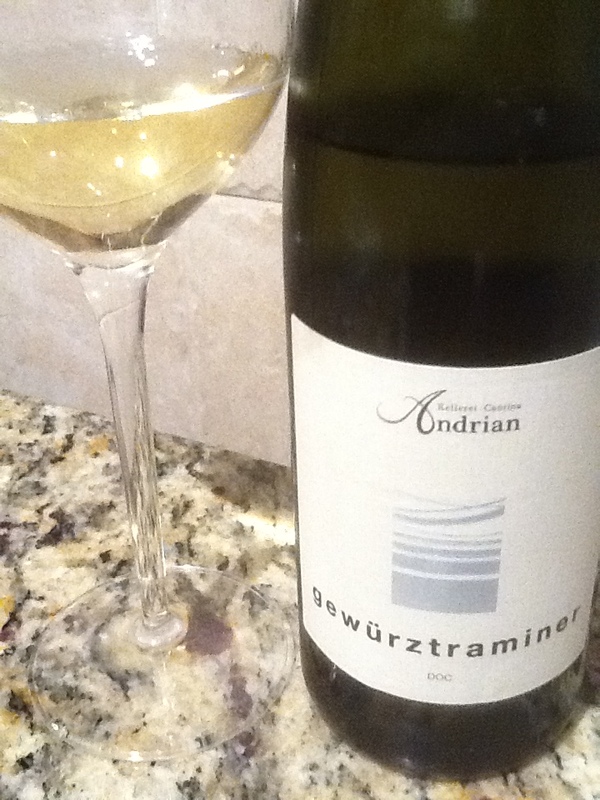 Kellerei-Cantina Andrian Gewürztraminer DOC 2012. 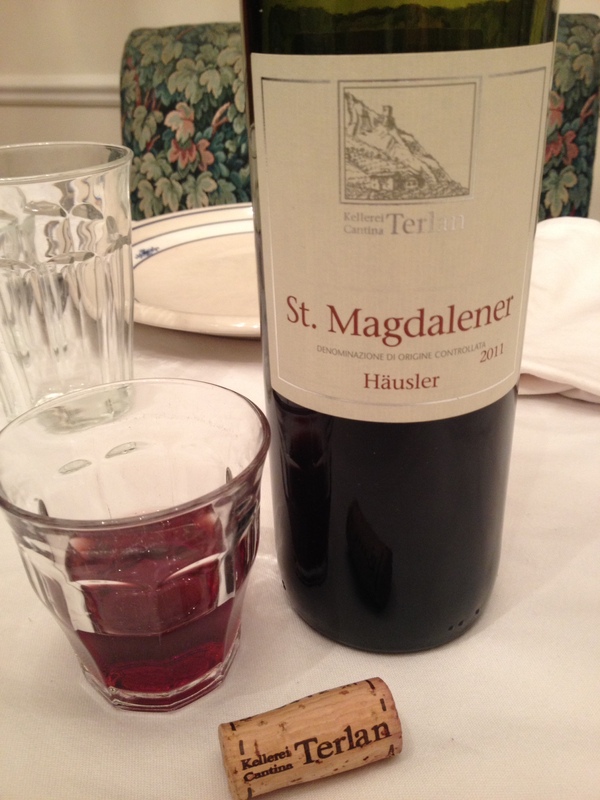 Sample Provided by Alto Adige Wines. 14.5% ABV, MSRP $16. Color: pale straw. Nose: a delightfully aromatic wine, slightly perfumed, touch of citrus and jasmine with underlying floral blend. On the palate, If there ever was a wine that came close to a handmade salted caramel, this might be it. Lychee is the initial fruit, followed by notes of toffee and butterscotch, and an amazing blend of sweetness, acidity, and salinity that made it difficult to put the wine down from either my nose or mouth. Addictive. This is a 90+ point wine all day long, and it was so tasty that I kept this bottle for a several weeks, rationing tiny sips just to keep reminding myself how delicious it tasted. Every time, the aromatic wine with sweetness and a noticeable salinity just knocked me out. I did several searches for this wine locally and found consistent ratings in the 90-92 point range, prices $20 and under, and limited availability (usually only several hundred cases per year in the USA). So you won’t find it on grocery store shelves, but when you do find this, buy me a bottle- I’m good for it. Yes, it’s just that darn good. And each of these is something special. Look for wines of the Alto Adige region (also known as Suditirol) to start popping up in the least expected places, on wine lists you love, in your wine stores. Why? They are a Powerhouse region, providing solid wines with great value, my friends… this is the next big thing in wine.